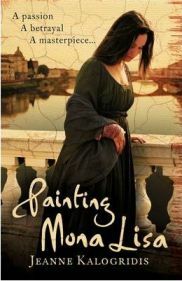 Painting Mona Lisa by Jeanne Kalogridis is a great Italian historical yarn with plenty of twists. Lisa di Antonio Gherardini Gioconndo, who is known simply as Madonna Lisa, sets the scene for this novel in the prologue. (Of course, if you are of common class, you will know her as Mona Lisa.) In the Florence of 1490, she is just coming up to the celebration of her 18th birthday, and she requests what I think is an unusual present. I soon get fond of Lisa who is a very determined young lady once she sets her mind to something, but also shows a lot of kindness to those in need. The author then takes us back further in time to give readers background history to enable us to understand the story. This includes the historical fact of the assassination of Giuliano de Medici, brother of Lorenzo the Magnificent, in 1478. All the main characters are well developed and her words made it easy for me to imagine that I had been transported back in time to Florence. The sights ranged from great art to executions, or a combination of both. It wasn’t essential for the artists commissioned to capture a likeness of those hanged on the gallows to work quickly, as bodies were left until they felt off the rope due to decomposition. The smells included those at the cathedral at the time of Sunday Mass, the stench of the poorest at the back, the lavender of the merchants, and the wealthy at the front, who smelt of roses. The plot includes the family life of the main characters, as well as their involvement in power struggles. I especially appreciated all the twists, which increase their frequency towards the end. I prefer authors of historical fiction to indicate which parts of their novels are fact and which fiction, like Philippa Gregory and Christie Dickason. Jeanne Kalogridis doesn’t make the difference between fact and fiction obvious in this book, but as it got me interested in a part of history that I knew little about, I had a look round the internet to expand my knowledge. It is now widely believed that LISA GHERARDINI was the subject in the Mon Lisa painting. It was possibly commissioned by her husband Francesco del Giocondo or Giulianno Medici. The various stories and mysteries that have grown about this painting were the possible reasons that the author decided to add her own interpretation. Even though historians now believe they know who Lisa was, in the past this painting has been said to be of the Leonardo’s mother, or even a self-portrait. Recent research published by the Discovery Channel suggests that Lisa Gherardini “lead a very ordinary life,” unlike the one in this story. But both fact and fiction agree on the names of her parents, and that she married a Florentine silk merchant. The powerful MEDICI family were famous for sponsoring art, their banking business and producing popes and rulers of Florence. The family members most prominent in this story are Lorenzo The Magnificent (1449-1492), and his three sons Piero, Giovanni and Giulianno. While the story is true to these basic facts, the elaborate plot including Lisa Gerardina, doesn’t appear to be supported by what most historians now believe. In the book she meets the artists Botticelli, Leonardo da Vinci and Michelangelo through visiting the Medici family’s palace in Florence. The historically important PAZZI family who are also bankers, as well as being political rivals of the Medici, are also included in the plot. The Dominican FRIAR GIROLAMO SAVONAROLA was real. Both story and history say that he preached damnation to the wealthy, that he says squander their wealth on such things as fine cloths and pagan art. His accusations include his once benefactor, Lorenzo The Magnificent, which helps undermine Lorenzo’s power. Savonarola uses his power to create the Bonfire of the Vanities, where what he called pagan works of art and books were burnt. Some of these were acquired by an army of children who entered homes taking and destroying anything they thought was evil. His boss, the Pope, is not a fan of his. I found this tale great entertainment, with lots of twists about love, hate, wealth, poverty, power struggles, violence and deception. It also made me interested enough in the history of the time to do some of my own research. However, I now believe that there are factual inaccuracies. These did not detract from my enjoyment of the book, as I was ignorant of the history of the time while reading it. My guess is that for others, with knowledge of Florentine history, these inaccuracies might be annoying. No Comments on "Mona Lisa, Leonardo & Florence"
I am a member of the National Trust, English Heritage and Royal Horticultural Society. Favourite book categories are historical fiction, history and humour.